PLAYA LAIYA. Pre-selling beach lots. MANILA, Philippines – Lot owners of Playa Laiya, the premier luxury leisure-residential development in San Juan, Batangas have one more reason to be happy about their residential tropical paradise: the exclusive Playa Laiya Beach Club is now open to give them more relaxation and fun in the sun. The Playa Laiya Beach Club launch gathered together lot owners and selected guests at a beach party that allowed them to enjoy the Beach Club’s amenities which include kiddie pools, a Jacuzzi, and an infinity edge lap pool. There are also several cabanas, located either by the pools or the beach that can accommodate five to 15 people. Guests also enjoyed various activities such as kayaking, massage treatments and boat tours of the coastline of Laiya, while kids loved designing their own flip-flops and making Hawaiian lei necklaces and bracelets. In addition, the Playa Laiya Beach Club has a bathhouse, a veranda and a pool deck for lot owners and their guests to enjoy. “The Beach Club is an exclusive amenity of residential lot owners of Playa Laiya. However, guests may be allowed usage if they are endorsed by a lot owner,” said Albert Villa-Real, VP for sales. Now that the Playa Laiya Beach Club has been launched, lot owners may already enjoy its amenities. “Due to the high demand for Playa Laiya lots, we recently launched a new phase located in the northern portion of the property,” Villa-Real said. Lot owners in some phases may start their house construction in the first half of 2012. Playa Laiya has a unique concept and theme that integrates a residential village and a leisure-tourism estate. This creates a more convenient and less costly arrangement for its residents who wish to enjoy the leisure component of their residential property. “Other developments employ a club membership system, but our system in Playa Laiya is better. Our residents will only have to pay for usage of the amenities and, of course, the village association dues for the maintenance of the village and its amenities. There is no need to pay for a country club share and monthly membership dues,” said Villa-Real. Playa Laiya’s tropical paradise setting and its Beach Club amenities are exclusive to lot owners and residents so they could fully enjoy their privacy and the amenities the Beach Club offers. Playa Laiya also has a commercial and tourism component in its development through its leisure-tourism estate. It is envisioned to have commercial operations such as dining establishments, accommodations facilities, and merchant outlets. Third-party locators and business owners will have the chance to purchase commercial lots at the leisure-tourism estate. Being commercial in nature, it will be open to the public. The Beach Club’s bathhouse features a contemporary tropical Asian design. “We envision this place to be another Boracay here in the Philippines or like Costa del Sol in Spain. But instead of taking a plane and a boat to an island resort, our guests can come here by car. We are just two and a half hours away from Alabang. It’s very convenient,” said Rachel Quinto, project head of Playa Laiya. “Playa Laiya features a fantastic beach located within a seven-kilometer white sand shoreline with a huge beachfront area measuring about one kilometer. The beachfront on the west side has fine white sand that looks really beautiful especially in the summer,” added Quinto. LOTS ARE SELLING FAST. It’s best to reserve your beach lot now. Take advantage of pre-sell prices, special discounts and interest-free payment plans. For inquiries, don’t hesitate to call me ANY TIME, day or night. I’ll be very happy to help you out. 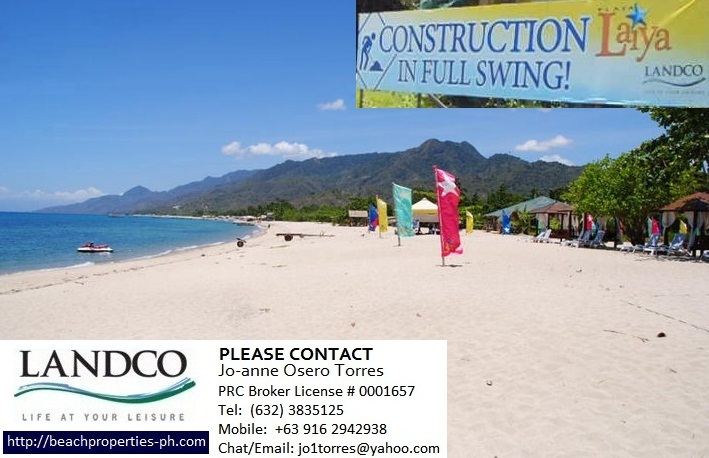 Be part of the most exciting beachfront development in Batangas. Please click https://beachproperties.wordpress.com to go back to the whole webpage. Hi Joanne, fell in love with Playa Laiya Complex. Would you be kind enough to e-mail me further information. I would be looking for a beach front Property. Are there any near-by Schools ?. Shopping Facilities ?. How many Bedrooms in the Property ?. Finally the bottom line question the cost of all the Properties that are available. I look forward to your reply in due course. Hello Mr. Budge! I sent all the information to your email. Thank you! Thanks also. You have a great site. 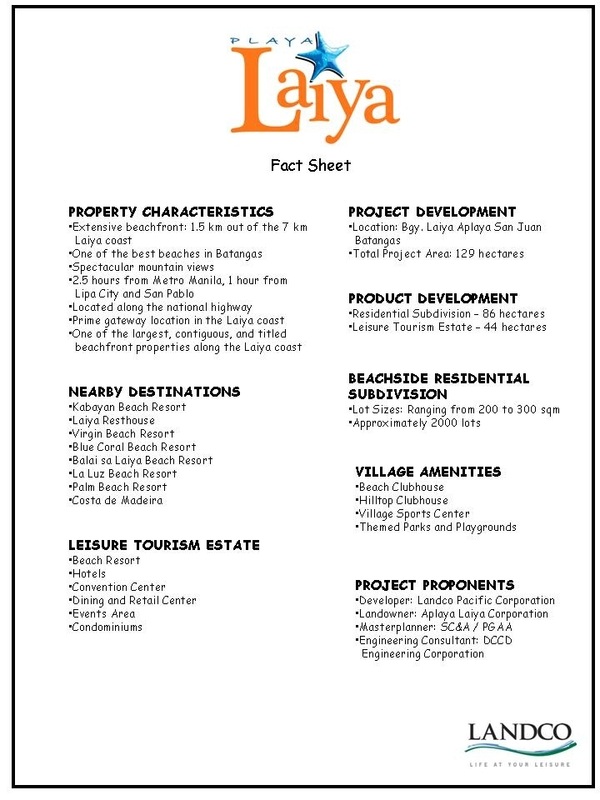 Are there any recent developments on the Playa Laiya project? thanks? Hello Ms. Judith. Thank you for inquiring. The first of three swimming pools in the Beach Complex is now ready to use. I sent pictures and other info to your email. wow! everything i needed to know about playa laiya is here. great site joanne! i’ll call you soon. WOW! This is a really nice place in Batangas! I Think it really cool in beautiful place to have a vacation. My hobbies are going to a different beach resorts. I’ve been in Calatagan, Bauan, Cuenca, Calaca, Ibaan, Laurel and Lian. I would definitely try this place too. this property looks very interesting. are there possible dive sites here? seems to me that the it is endless sea and no mountains? just the same, please send me details esp. payment scheme. Can you please send me quotations and computations of this property.. the total amount and if there are terms available..
Map also of the available lots. Please send me more info regarding lot availability with map location, size, pricing and additional pictures. As an owner of a lot, how much is monthly association fees? Thus, it means I’m a member of the beach club? What facilities that are available for me? HI, Can I get more information about the available lots and prices and financial plans for each. 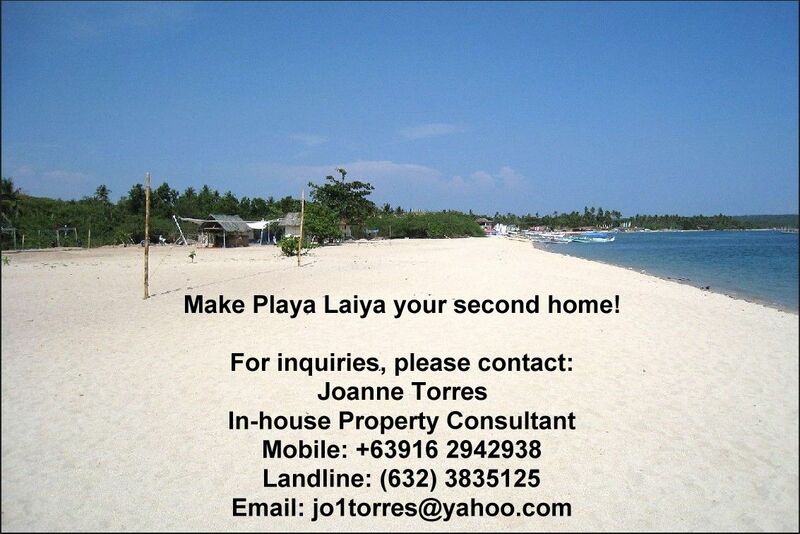 I want to purchase a property by the beach and this Playa laiya looks promising to me. I am currently updating the inventory, pricelists and maps. I will send them all to you as soon as I finish.. I am glad to hear that Playa Laiya looks promising to you. I hope I will be able to convince you that it is indeed the best place to build a beach home especially because the location is safe from tsunami. We envision the place to be the next Boracay of the Philippines. The Leisure-Tourism Estate shall become the hub for commercial activity such as restaurant dining, retail shopping, hotel and accommodations, and various tourism services along the coast of Laiya. I sincerely believe that this will be a very beautiful leisure community and it will be my honor to help you become part of it. Thank you for your time, Ms. Frances! I will get back to you in a while. Can you send more info to my email? Sure Ms. Chiqui, I’ll be happy to 🙂 Thank you very much for your interest!